Our first port of call was, Glacier 3000, it is about 30 minutes up the road from Leysin and offers the highest skiing and most challenging runs in the area. The website claimed there was powder to be found, I had my doubts but we decided it was worth a go. 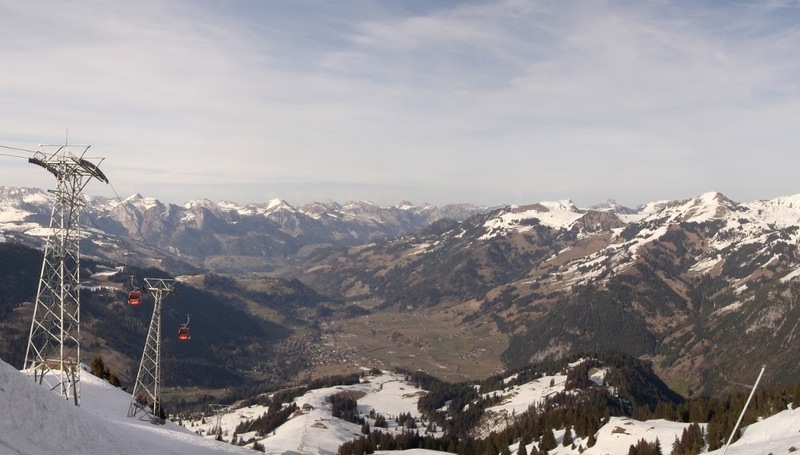 We bought lift passes that covered the neighbouring areas that fall under the Gstaad Mountain Rides banner. There's nothing like kicking off your day with a gentle warm up, but for us the first run was the steep and icy black graded pistes heading off the back of the glacier. The hard snow made this tricky run even harder, but we must be getting better because we both made it down without incident. There appears to be a natural order which dictates that Carl will always be the first to the bottom regardless of the angle of inclination of surface and it has the potential to be a blisteringly quick run in these conditions. We had hoped to enjoy the off piste bowls to either side of the run, but it too was hard, icy and bumpy. I was prepared to give it another go, but Carl wasn't inspired by the technical challenge "Too many turns" was his terse assessment of the situation. We headed back down to the car for an early lunch then followed the road towards Gstaad, following the true spirit of the blog we were off to explore were we could skibike in the area and if possible, plant the freestyle skibike flag on another mountain. We had spotted an interesting looking area called Rougemont and stopped there first, it was a ghost town, the few locals we could find told me that it closed at the weekend. This was a shame as it did indeed have some interesting looking topography and I shall ear mark this area for investigation next season. I was also shown which areas were still open for business, so without out further ado we piled back into the car and headed off. Heading in the appropriate direction I spotted a slope with skiers and what appeared to be a little bubble gondola. We found the base station, parked up on what appeared to be a surface made from pallets gradually sinking into the mire and set about skibike re-assembly. I can do this in about 3 minutes, but for Carl's skibike with 8 mounting screws to fit, it takes a bit longer. Approaching the gondola it turned out to be a mini-chairlift with a cover over the top, no sooner had I gone through the gate than the attendant came rushing out and stopped me. He seemed furious that I would have the audacity to use his lift and grudgingly pointed out where such dastardly inventions as a skibike could be used. There was no way that Carl wanted to disassemble his skibike yet again, so we found a way to cram it into my tiny sub-compact car and drove off with the hatchback open. In search of the correct uplift, we didn't find the exact lift, but did manage to find the gondola station at Zweisimmen. There weren't any issues with our skibikes, in fact the gondola had hooks you could hang your skibike from. The down side turned out to be that we were only allowed to go as high as the middle station which serves the mixed use piste where sledges, Yooners and just about anything else goes. It's an easy piste, the only challenge was keeping on the tiny ribbon of snow that remained. In order to see what delights the top station could offer, I switched over to blades and headed to the top. The look on the lift operators face when he came over to turf me out at middle station was priceless. From the top station there is a selection of red and blue runs down, nothing as challenging as our early morning black run warm up, but "rules is rules". What a crazy day, jumping in and out of the car, things on the verge of falling apart, no real plan, just two skibike fanatics bouncing along the rural roads of Switzerland frantically in search of a lift that will take us to a pocket of soft snow. You don't get laughs like this on a package holiday.